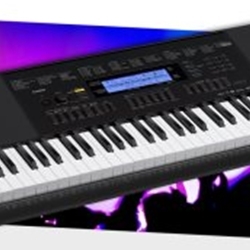 The Casio WK-245 keyboard gives you a tremendous amount of features in a trim 76-key package. With the WK-245, you get 600 built-in sounds so you can play any style and follow your inspiration. And with 180 rhythms for you to play along with, it’s like having your own backing band. When it’s time to record your ideas, the onboard 5-song/6-track recorder is standing by. The WK-245 even offers onboard sampling! If you need an instrument that’s ready to serve your creativity, the Casio WK-245 is a smart choice.